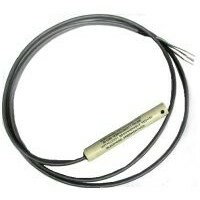 The EI-1050 is a digital relative humidity and temperature probe Intended for use with the Labjack U3, U6, UE9, or U12. It combines a single chip sensor module with a chip selector and buffering components on a small PC board. The single chip sensor Manufactured by Sensirion biedt a 14-bit / 12-bit (temperature / humidity) serial digital output for each reading. It is housed in a plastic tube (4.5 in by 0625 in) with a 6 ft cable. The device includes two calibrated microsensors for relative humidity and temperature. Since the output serial digital data, this results in superior signal quality, a fast response time and insensitivity to external disturbances (EMC). Each sensor is calibrated in a precision humidity chamber and the calibration coefficients are programmed into the OTP memory. These coefficients are used internally constantly measurements to calibrate the signals from the sensors. 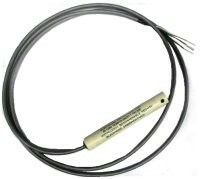 The interface to the EI-1050 is a five-wire connection Consisting of supply voltage, ground, clock, data, and enable. By using the line enable multiple probes can be connected to a Labjack at once. The Enable line Has A 22k pull-up (to the Power line). The Data line Also has a 22k pull-up, but Only When the probe is enabled. The Clock line does not have a pull-up. The EI-1050 uses an SHT11 digital sensor, and a key specification of this sensor Is that the signal input voltage for a logic-high is 80% -100% of the supply voltage. If the supply voltage is 5.0V, that Means 4.0-5.0V, but all LabJacks, except the U12, have 3.3V digital logic where a high output is 3.3V. This is not a problem for the data line, since to get a high on the serial bus the I / O line is set to input and the 22k pull-up brings the line above 4 volts, but the Clock line is driven output high / output-low. Thus the EI-1050 must not be powered by 3.3V 5.0V. The Data, Clock, and Enable lines, ook all have an RC filter Consisting of a 47 ohm resistor and a capacitor 1 nF. Although the temperature sensor and associated electronics are rated for 150 degrees C, the cable is only rated for 80 degrees C. We have tested the cable, probe at 150 degrees C, and have NOTICED the cable gets soft at the high temperatures but continues to function. When the cable and probe were Returned to normal temperatures, no degrading was observed in the cable or probe. Also at the low temperatures, the cable is only rated to -20 degrees C where the sensor and associated electronics are rated lower. Testing the probe with the wire at the lower temperatures Showed normal operation and no degrading of the cable When Returned to normal temperatures. The user shouldering be awarethat eventhough the probe itself can operate at the rated temperatures the use of the cable in environments of about 80 degrees C and lower than 20 degrees C is at your own risk. The tube biedt protection from fingers and large contaminants, but if your environment Has The risk of smaller contaminants zoals insects, dust, or rain, additional protection is recommended. Red Wire (Power): Since the UD series devices have 3.3 volt digital logic, the EI-1050 must be powered by 3.3 volts, not by the 5 volt US terminals. The simplest way to get 3.3 volts is by using a digital line configured as output-high. An analog output (DAC) Can also be used. Note that a single line can only FIO providence enough power for up to four probes. An EIO / CIO / MIO line or DAC line can providence power for up to 20 probes. FIO6 is used in the pseudo code below. Black Wire (Ground): Connect to any GND terminal. Green Wire (Data): Any digital I / O line can be used. FIO4 is used in the pseudo code below. White Wire (Clock): Any digital I / O line can be used. FIO5 is used in the pseudo code below. Brown Wire (Enable): The probe is enabled When this line is pulled to the supply voltage (3.3 volts for UD series devices). The probe is disabled When this line is pulled to ground. This Allows multiple probes to be connected to a single device using the same data and clock lines, and only a unique Enable line is required for each probe. If only a single EI-1050 is being used, the Enable line can be left unconnected as there is an internal pull-up resistor to the power line, but it is recommended That the Enable line be connected to the same terminal as the Power Line for continuous enablement. If multiple probes are being used, They are all connected to the same Power / Ground / Data / Clock terminals. The Enable line on each probe is connected to a unique digital output, and all are set to output low to disable all probes. To get measurements from a Particular probe, the line Enable For that probe is set to output high, readings are taken, and then the Enable line is set back to output-low. LJ_ioSHT_GET_READING LJ_chSHT_TEMP // Used with IOType above. LJ_chSHT_RH // Used with IOType above. LJ_chSHT_DATA_CHANNEL // Used with LJ_ioPUT_CONFIG. LJ_chSHT_CLOCK_CHANNEL // Used with LJ_ioPUT_CONFIG. Multiple EI-1050 probes can be connected to a single Labjack U12. When using multiple probes, the data and clock line from every probe connect to the same Labjack terminals (IO0 and IO1). An individual connection is needed for the enablement line on each probe. The Enable line is pulled high inside the probe so the probe is enabled When this line is disconnected (not recommended), connected to + 5V, connected to an analog output set to 5.0 volts, connected to a digital input, or connected to a digital output set high. The probe is disabled When the enable line is connected to GND, connected to an analog output set to 0.0 volts, or connected to a digital output set low. This can be accomplished using IO2, IO3, AOX, or Dx, providing multiple connections enable line. The example programs provided by Labjack Corporation, toggle the digital lines between input and output and low to enable and disable the probe (analog outputs are toggled between 0.0 volts and 5.0 volts). When the probe is disabled, it is powered up, but there is no communication. There are two example applications available from Labjack Corporation to experiment with the EI-1050 probe (s): LJSHT.exe and LJSHTmulti.exe. These are installed as part of the normal U12 Legacy installation and can be found in the Start menu alongwith LJlogger, LJtest, and others. LJSHT acquires temperature and humidity readings from one or two probes and displays the information on a chart. LJSHTmulti acquires readings from many probes and displays the current readings in a table. SHT1x: This is the only function most programmers will use, and retrieves a temperature and / or humidity reading. SHTComm: A general function That Sends and Receives up to 4 bytes to / from a SHT1x sensor. Allows access to advanced features of the sensors. SHTCRC: Used with SHTComm. Returned checks the validity of a CRC byte. For more information on the driver functions, see the "Labjack U12 User's Guide". Labjack U12 firmware V1.10 (serial numbers 100 012 000 and higher, 03/2003) and later has new functions to perform the SHT1x communication at a hardware level, Such That One call to the Labjack U12 will send / receive up to 4 bytes of data . When using hardware Such communication, it takes about 230 ms to get a 14 bit temperature reading and about 75 ms to get a 12 bit humidity reading. The Labjack U12 is constantly busy this time and unavailable for other operations. When the Labjack U12 driver detects assigned a firmware version V1.10 Earlier than, it reverts to software communication mode, and takes about two seconds to get a temperature or humidity reading. The Labjack U12 is constantly busy this time and unavailable for other operations. Firmware upgrade requires the replacement of a chip (All which is socketed, not soldered). Contact Labjack Corporation for more information.